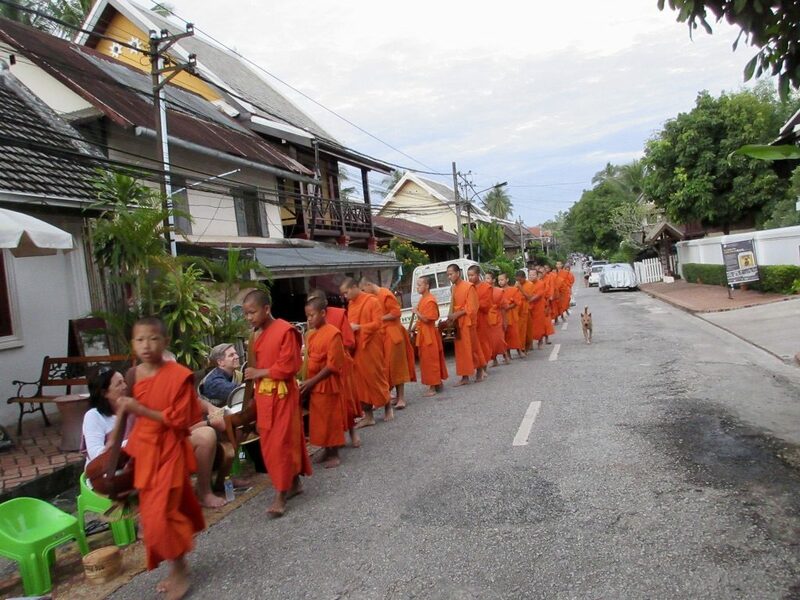 On our last morning in Luang Prabang we rose at 5:30am to help feed the local monk community out in front of our hotel. Each morning hundreds of monks from 113 temples can be seen walking the streets collecting alms or food and money. Our group leader had arranged for long carpets to be placed in the street with tiny plastic chairs placed in a row. In front of each chair was a woven basket with a lid filled with cooked sticky rice, a staple in the diet of the local people. We were given sashes to wear and we had to remove our shoes as a sign of respect to the monks. As we were seated, the local monks paraded by us, open the lid on their pots and we would place a golf ball sized lump of sticky rice in each of the monks’ pots. They continued to come in several groups over a period of time of about 45 minutes. The locals start their day at 4:00am when they rise to begin cooking the sticky rice that they will give the monks that morning. They sit on small stools with fabric sashes as well. Very interesting. Next, we were taken by minivan to the local morning market where the locals go each day to pick up groceries for the daily meals. The narrow alley ways were filled with one stand after the next and the locals were busy shopping for all things from the common to the exotic. 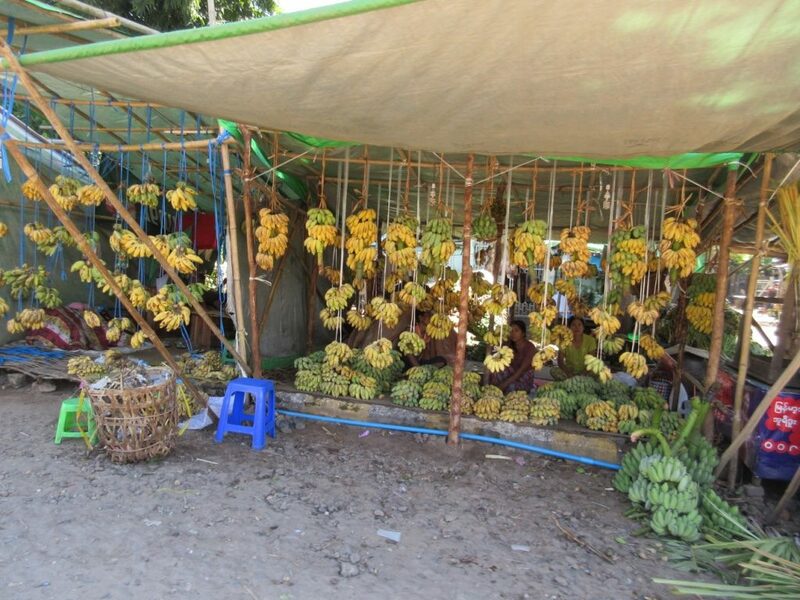 The fresh fruits and vegetables were beautiful, the fish, poultry and meat not so appetizing, but then there was the exotic. We saw live chickens, live ducks, live bats, live crabs, live toads, barbecued rats, live eels, live snakes and most anything else you might could imagine. By 11:00am we were headed to the airport for the long and exhausting trip home. From Lunag Prabang we flew about two hours to Bangkok where we had a four-hour layover. From Bangkok, we flew about three hours to Hong Kong where we had a 90-minute layover. From Hong Kong, we flew about 13 hours to Los Angeles. By this time, it was too late in the evening for us to fly to San Diego that night so we had to transfer to a local hotel for the night. The next morning after our 11-and-a-half-hour layover we flew the final one-hour flight to San Diego. A very long trip home, but glad that we went. Our first stop on this morning was at the former Royal Family Palace Museum and Residence called Haw Kham. Built for King Sisavang Vong and his family in 1904 during the French Colonial era, it was later occupied by Crown Prince Savang Vatthana and his family. In 1975, the monarchy was overthrown by the communists and the Royal Family was taken to what they called re-education camps and the palace was converted to a national museum. The palace was built within a large walled compound with lovely lily ponds, lush trees, meandering paths and green grass lawns. We visited a temple located just inside the main gates of the property that houses the museums most prized art, a small Buddha called Phra Bang. The statue dating back to the first century was cast in Sri Lanka of gold, silver and bronze alloy and is about 33” tall and weighs about 110 pounds. Some question the authenticity of this Buddha being the original, but it is highly guarded and no photos are allowed. They require you to remove your shoes to climb about 20 steps to the entrance of the temple, but no one is allowed inside the door. You can only look through the open door. The main residence is also highly guarded and they require you to leave all bags, large purses and cameras in lockers before being allowed into the building. The royal residence is very nicely preserved and is filled with much of the original furnishings, family jewels, wall murals and gifts to the royal family. Outside the residence there is a large garage where some of the royal family’s cars are preserved including an Edsel, a Jeep, a Lincoln and a few others. Outside there is a large statue of King Sisavang Vong on the palace grounds. We then took a short drive to a local temple where we met with a local monk who seemed more interested in his phone than speaking with us. He did not speak English so Sone was interpreting our questions and relaying the answers to us. Not a highlight of the trip. Our next stop was the Traditional Arts & Ethnology Centre where they celebrate the ethnic cultures and diversity of the Laos people. They have 49 ethnic groups and 15 languages in the country. The museum is small but had a nice assortment of handicrafts, traditional arts and displays about some of the local groups. The museum shop was very popular with our group and many folks purchased some of the handicrafts offered for sale. We had a huge lunch at a local restaurant where the food did not stop coming. They served a beautiful array of local dishes like spring rolls, lemongrass chicken, chicken curry, vegetable soup, rice, stir fried vegetables, eggplant and dessert. Everything was delicious but way too much food. In the afternoon, we took an optional tour to a local village where they create several types of handicrafts including silk weavings. 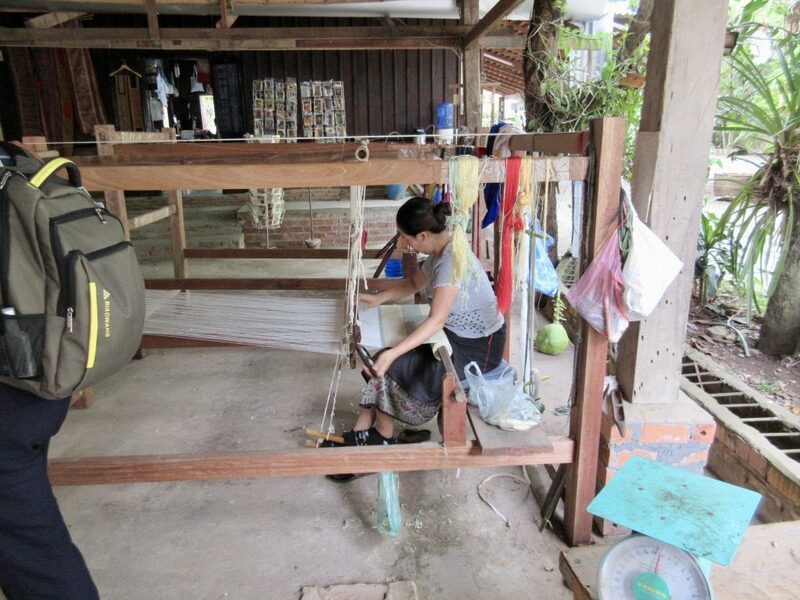 In the local village, they grow the silk worms, process the silk yarn, dye the yarns, all before beginning the weaving process. This village also creates a lot of handmade paper which they sell to local artist for painting on, they create paper bags, they create wrapping papers and greeting cards. Of course, they had a gift shop where you could purchase the local items and many of our folks did some damage. We then took a short walk down to the Mekong River’s bank where we boarded a boat for a sunset boat ride on the Mekong. Onboard they served us roasted peanuts, potato chips, wine, beer and soft drinks. The ride along the river was very nice although not too much to see other than the beautiful surrounding green mountains and a few homes and villages along the river. Dinner was back in town at a local restaurant that served us many traditional Lao dishes that we had not seen previously. Things like chips made from river weeds and barbecued water buffalo which was very tough but tasty. The dishes were plentiful and we probably sent back to the kitchen more than we ate. 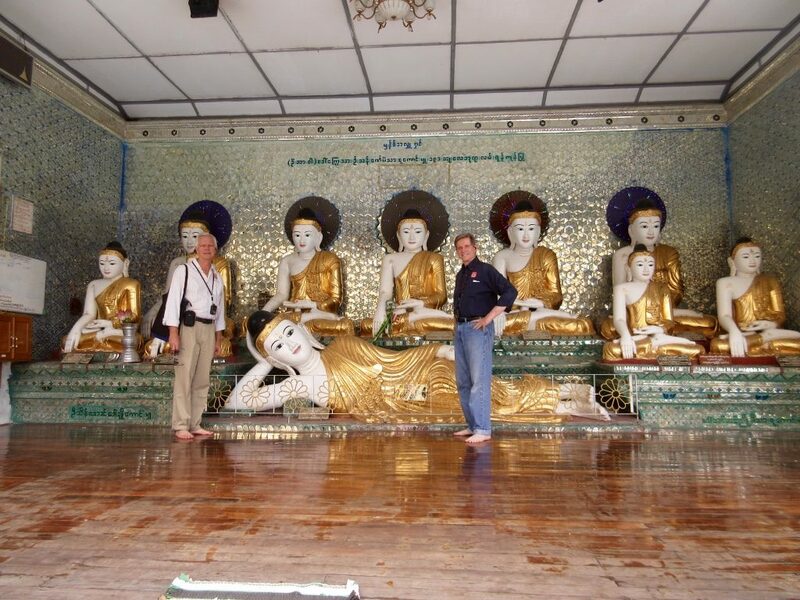 All in all, our visit to Laos was very interesting. 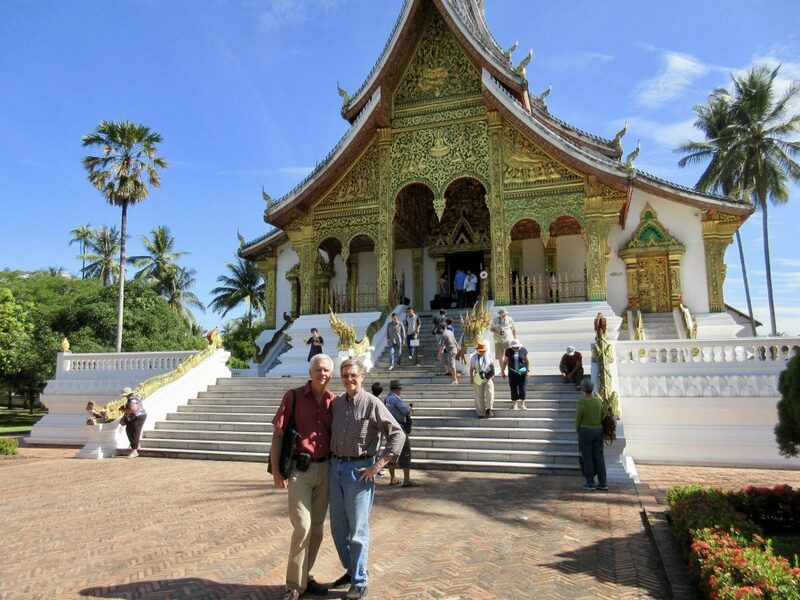 We were not that enthralled with our visit to Vientiane but we really enjoyed our time in Luang Prabang. The small-town feel, the clean streets, the charming cafes, unique restaurants, local handicraft shops and more were all very interesting. 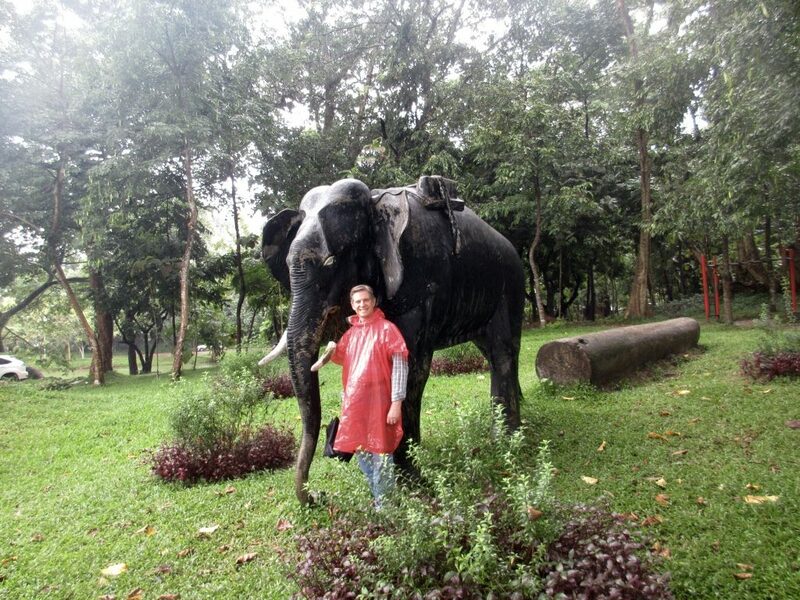 The locals in Laos were not as friendly as in Myanmar. We departed Vientiane about 9:00am bound for the airport and our short flight to the former capital of Laos called Luang Prabang. Luang Prabang was the royal capital of the kingdom until as recently as 1975. During World War II the town saw many battles and was occupied for short times by several foreign countries including France, Thailand, Japan and China. By March of 1945 a nationalist group declared Laos once more independent. 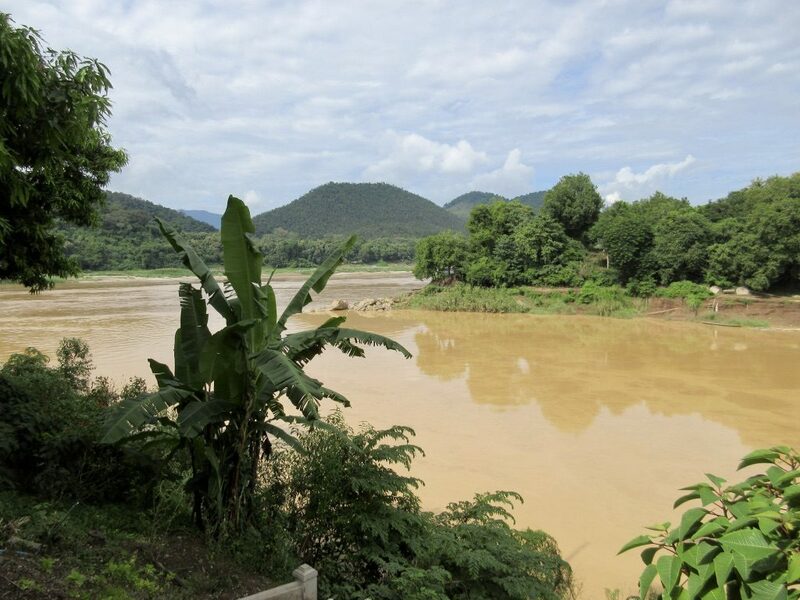 During the Loatian Civil War of the 1950’s 60’s and 70’s, a secret American airbase was located at Luang Prabang and it was the scene of fighting. Our hotel for the next two nights was the Victoria Xiengthong Palace Hotel with only 26 rooms and located within the historic portion of town. 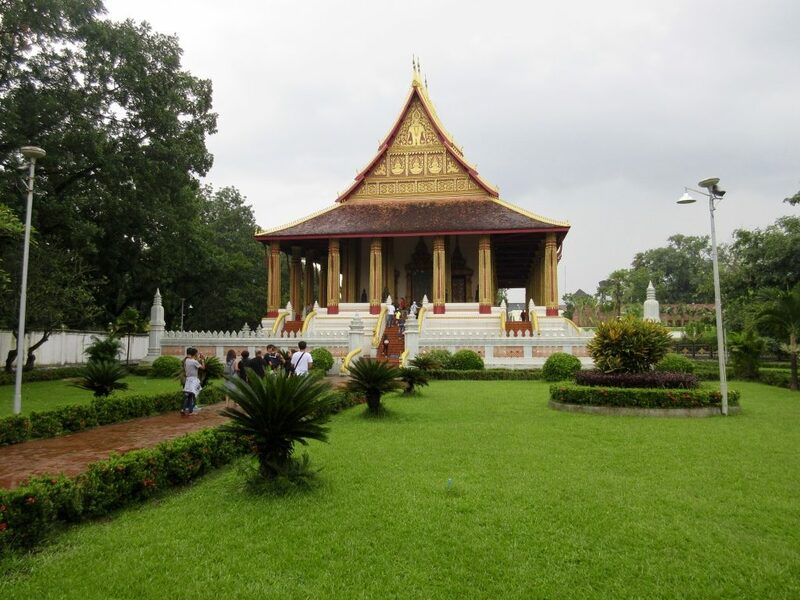 This complex of restored Colonial style buildings was the residence of the last royal family of Laos. 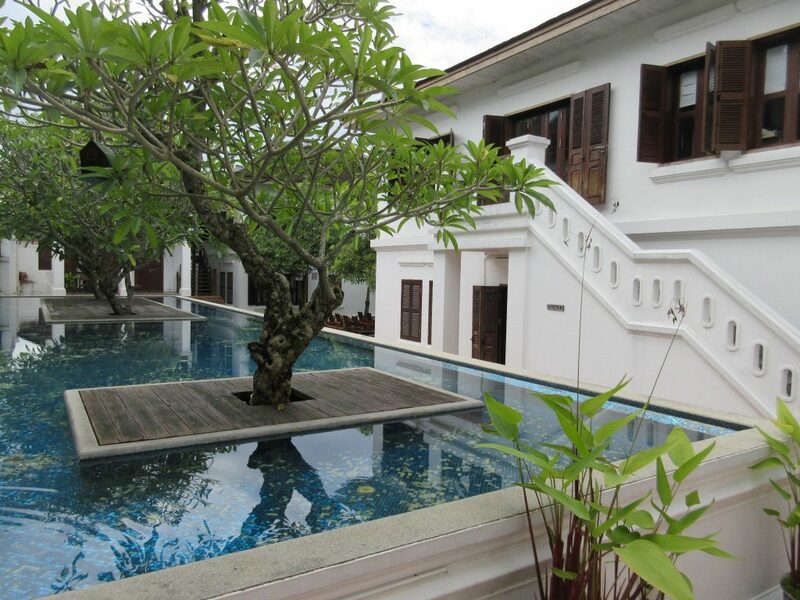 The rooms were beautifully furnished with large bathrooms, air conditioning, internet access and overlooking the Mekong River. Luang Prabang translated means Royal Buddha Image and is located in north central Laos. Luang Prabang is made up of 58 adjacent villages, 33 of which comprise a UNESCO World Heritage Site. Located at the confluence of the Nam Khan and Mekong Rivers, Luang Prabang is best known for its numerous Buddhist temples and monasteries. The population is about 60,000 people, with about 25,000 living within the World Heritage Site. After checking into our hotel about 1:00pm we met for up with our local city guide by the name of Sone for an orientation of the area around our hotel. Many of us had lunch on our own at a lovely hotel and restaurant located at the point overlooking the confluence of the Nam Khan and Mekong Rivers. It was a quiet, tranquil location overlooking the lush green vegetation on the nearby mountains and the river banks covered in bamboo, bougainvillea, haleconia, plumeria, red ginger and a variety of tropical blooming plants. Later in the afternoon we walked to a local Buddhist Temple complex called Wat Xieng Thong where we explored several of the temples, shrines, pavilions and gardens. Originally built about 1560 by Lao King Setthathirath, this temple was under the patronage of the royal family. 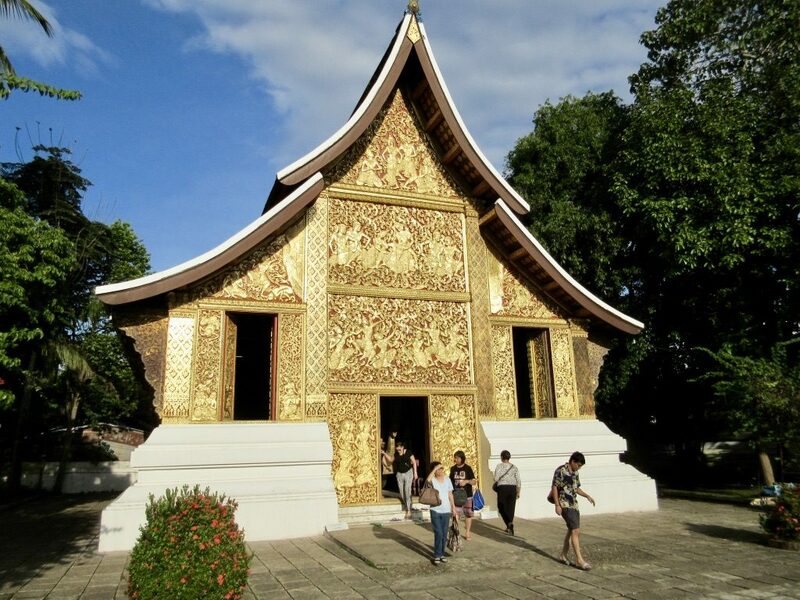 There is a beautiful Funeral Chapel, a ceremonial barge with gold dragons on wheels for processions and a large gold Buddha in the main temple. Outside there is a pavilion housing several extremely long rowing boats used for racing on the Mekong. Each vessel carries about 60 rowers in single file, so you can imagine the length of the boats. In the early evening, we took several vans to visit a nearby family home where they were to show us their local dances and to offer us a local blessing called the Baci Blessing. The Baci Blessing is used in the Lao culture to celebrate a special event like a wedding, homecoming, new baby, annual festival or in this case to welcome us to town as guests. About a dozen local neighbors gathered to welcome us with a silver bowl arrangement standing about three feet tall and placed in the center of the room on the floor. In the silver bowls were an assortment of flowers, banana leaves, bamboo stalks, cotton threads and an assortment of local foods. The neighbors were all kneeling around the bowl on the floor. An older gentleman considered the village elder who was an ex-monk led the ceremony, chanting a Buddhist mantra. The chanting by the elder was followed by the chanting of the mostly elder women neighbors. Each of the neighbors then took the cotton string from the bowl and tied a string around each of our wrists and offered a welcome blessing. Once each of us had several white cotton strings on each wrist, we were offered a variety of foods like small bananas, rice cakes, sweet sticky rice followed by a local rice whiskey, a potent liquor similar to moonshine. Next a group of local young girls dressing in ornate local dress performed several dances and several boys and a man accompanied them on local instruments. We enjoyed a beautifully presented dinner at our hotel in a private dining room of the restaurant. They offered a variety of fixed dishes like a pumpkin soup, spring roll appetizers and dessert. We selected our entrée of fish, chicken or a vegetarian dish. It was all very good. After dinner, we went into town a few blocks from our hotel to check out the local night market where there were hundreds of stalls selling local handicrafts and clothing. Lots of interesting things to look at but we left empty handed. 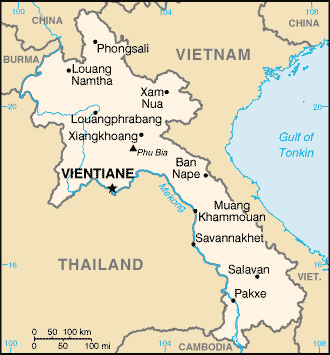 Vientiane is the capital city of Laos with a population of one million residents. 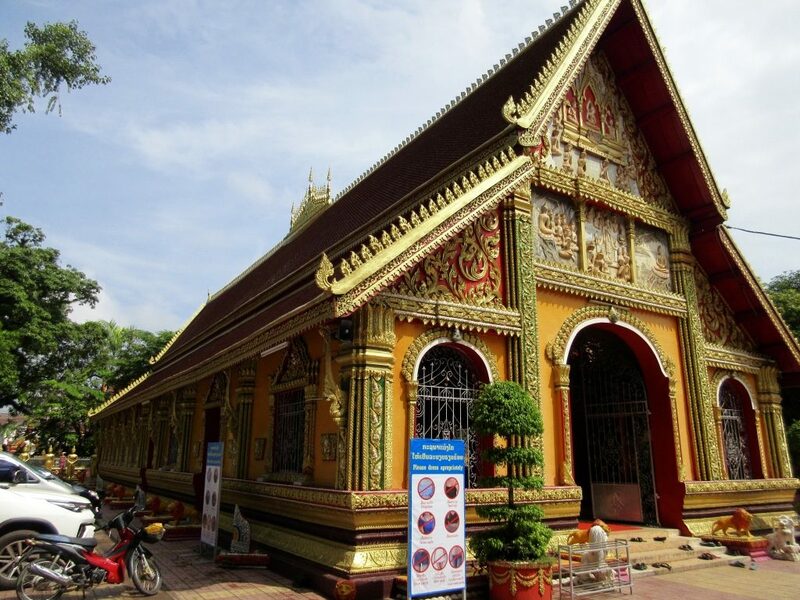 Our first stop was the Hor Pha Keo Museum and former Buddhist Temple built in 1565 to house an emerald Buddha. 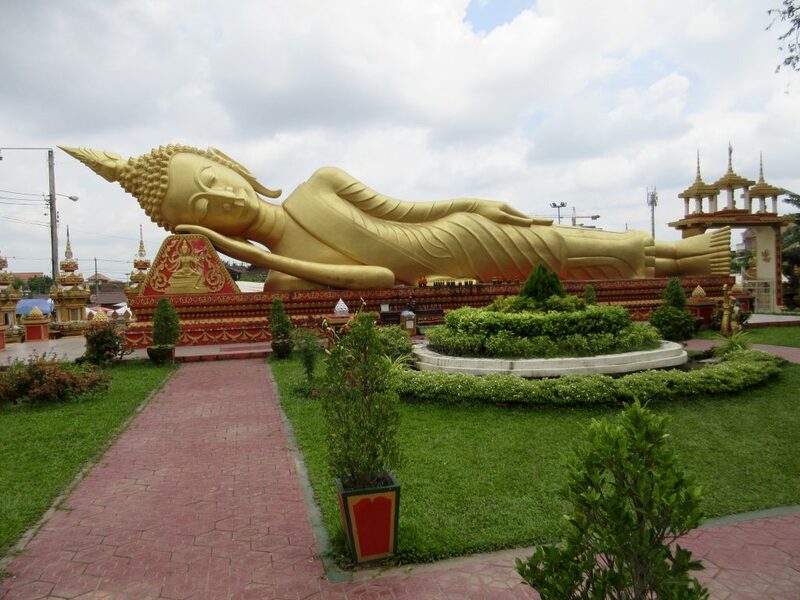 The Buddha stayed in the temple for over 200 years until 1779 when it was seized by the Siamese general Chao Phraya Chakri who founded the current Chakri Dynasty of Thailand. The Buddha now resides in Wat Phra Kaew in Bangkok, Thailand. 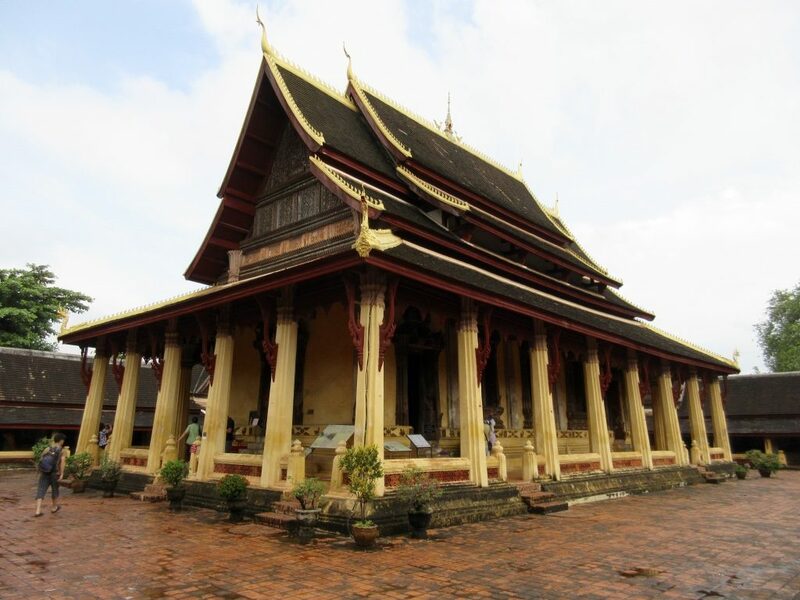 The structure today is used as a museum to house Laos religious art, particularly many Buddha’s in stone, bronze and wood. The museum is set in a beautiful park-like setting with many flowers, trees and grassy lawns. Across the street was our next stop at the Sisaket Museum and Buddhist Temple built in 1818 where they display a collection of 6,800 Buddhas. 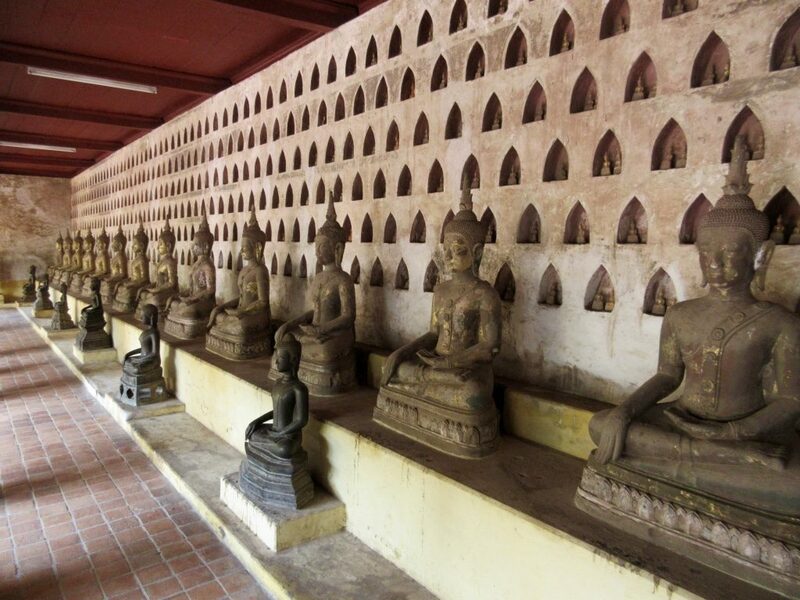 Many of the Buddha images are seated in hundreds of small niches in the walls of the temple as well as in the large cloister walls surrounding the temple. The Buddhas mostly date from the 16th to 19th centuries and come in all sizes but the majority of them are less than six inches tall. 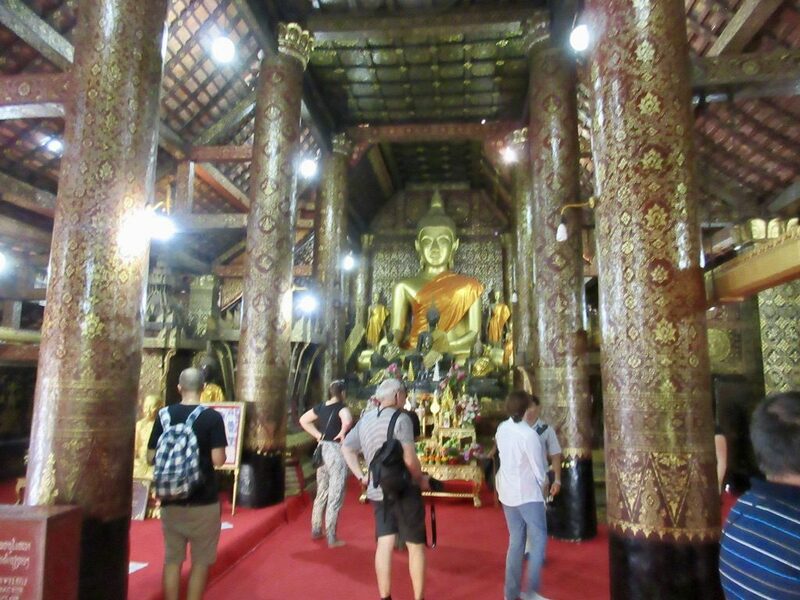 The interior of the temple has very detailed murals on all of the interior walls depicting stories of the Buddha. Our next stop was at Wat Si Muang Buddhist Temple originally built in 1563, but destroyed and rebuilt on several occasions. This temple is unusual in that it is divided into two rooms. The front room was a quiet room with a monk giving blessings to the locals while the rear room included a main altar with many statues of Buddha. The grounds around this temple were extensive with many other brightly colored buildings, statues, gardens and burial shrines. This temple seems to be frequented by many locals who purchase flowers and fruits on the grounds to place on the altar of the Buddha. Many candles were being purchased as were marigold blossoms, popular with the locals for their golden orange color, the Buddha color. 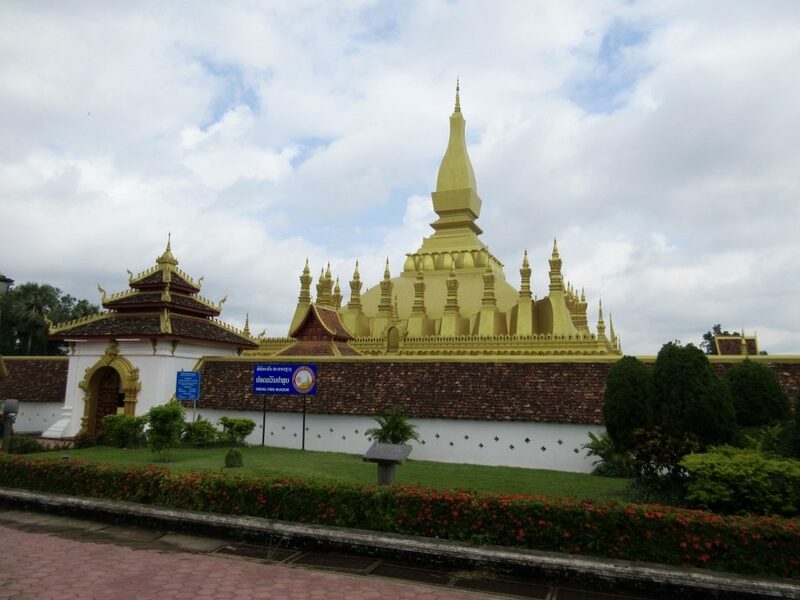 Next we headed across town to see a very large gold colored, square shaped stupa called Pha That Luang and regarded as the most important national monument in Laos. The stupa is believed to have existed on this site since the 3rd century, although it has undergone multiple reconstructions over the years. It had been recently repainted and appears to be in excellent repair. The base of the Stupa is about 225 square and nearly 150 feet tall. Surrounding the stupa is grass and a covered portico where more historic artifacts are housed. In comparison to many of the stupa’s we have seen in Myanmar, this is built in a very simple style and lacks much ornamentation. Nearby the stupas there is another compound housing many more Buddhist temples including a large gold reclining Buddha. 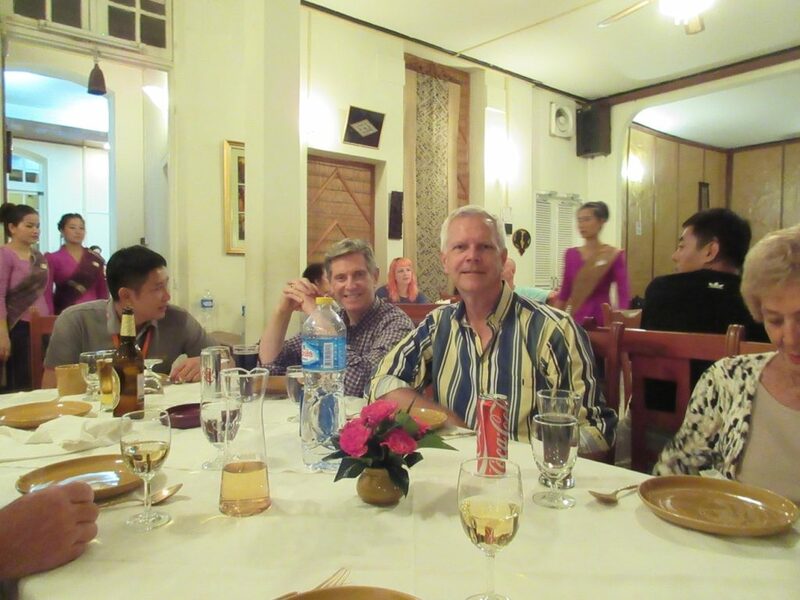 We then proceeded to a local restaurant where we enjoyed the air conditioning, clean bathrooms and a Lao-style lunch. We had a soup with pork and cucumber, followed by rice, stir fried beef, stir fried vegetables, a pork stew with potatoes and fresh fruit for dessert. After lunch we visited the Patuxai, Victory Gate or Gate of Triumph similar in style to the Arch d’ Triumph in Paris. The gate is a war monument built between 1957 and 1968 and dedicated to those who fought in the struggle for independence from France. The monument has five towers that represent the five principles of coexistence among nations of the world. They are also representative of the five Buddhist principles of thoughtful amiability, flexibility, honesty, honor and prosperity. There are two interior stairways where we walked up to the observation deck on the top to overlook the city. There are also many large souvenir shops located inside the upper levels of the monument. From the Victory Gate we headed to the local central market where they sell most everything you could imagine. This market consisted of a newer, air conditioned building with four floors next to an older multi-storied building filled with appliances, housewares, clothing, gold, souvenirs, menswear, ladies clothing, cosmetics and so much more. We spent about 30 minutes on our own looking around before meeting up and heading back to the hotel about 4:00pm. For dinner we met up with Gloria, Aileen, Mary and Allyn for dinner in the hotels Chinese/Japanese restaurant. The staff did not speak good English and our Lao is non-existent so we had a little miscommunication. The waiter thought that two of us had ordered two plates of food because we told the waiter that he could put two of our orders on the same check. It worked out fine and he took the two extra orders off the bill without any trouble. The money here is the KIP which is exchanges at about 8,277 KIP to one US dollar making the calculation of items confusing. We had a very early morning with a wake up call at 2:00am. We had to have our bags outside of our room at 2:45am ready for a 3:30am departure to the airport. The hotel provided boxed breakfast consisting of a mini croissant with a small piece of ham and cheese, a drinkable yoghurt, an apple, a hard boiled egg and a piece of cake. 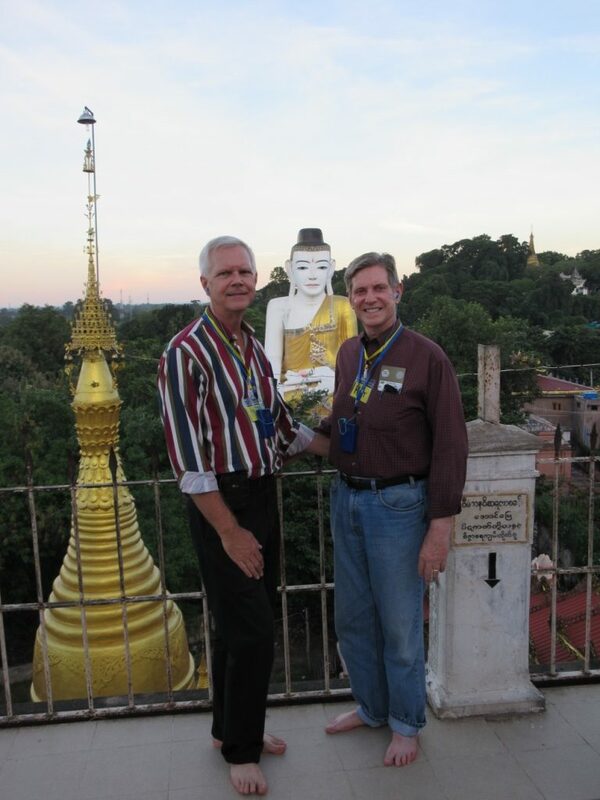 We had to fly from Yangon to Bangkok, where we changed planes for a flight to Vientiane, the capital of Laos. The connection time was very short between flights. Bangkok Air had an excellent airport employee who escorted our group from one plane to the next and through the airport maze of security and immigration. For example, we disembarked the plane on the tarmac and were transported by bus to an international terminal where we had a good walk and had to go through another security check. They held the flight for us but when we arrived in Vientiane half of our luggage did not make the flight. Laos is a landlocked country located between Myanmar, Cambodia, China, Thailand and Vietnam. Its land area is slightly larger than the state of Utah. The population is about seven million, 65% of which are Buddhist. Laos has been independent since July 19th 1949 when it broke away from France. The national language is Lao. 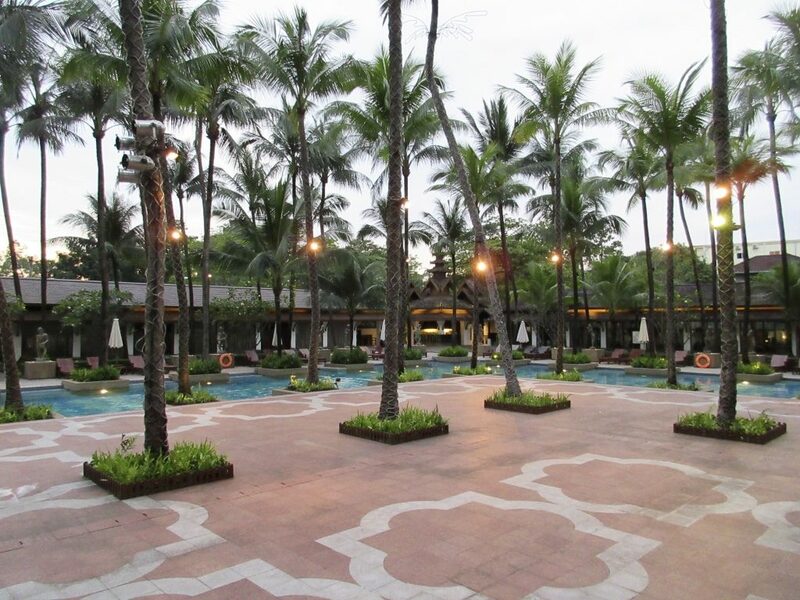 Our hotel for the next two nights was the five-star Lao Plaza Hotel built in 1997 with 134 rooms. It is a simple, clean-lined hotel located in the business district and just a few blocks from the Mekong River and the border of Thailand. Our local guide, Soane, took us for a walking tour around our hotel neighborhood to see the local businesses, restaurants, shops and the Mekong River. 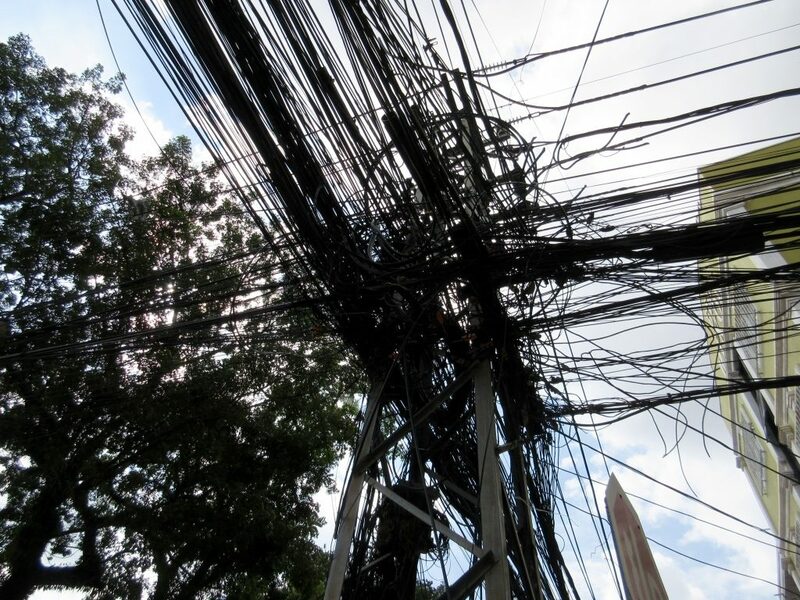 Most buildings are in poor repair and the sidewalks difficult to navigate. Traffic does not stop for pedestrians even though there are crosswalks so crossing the streets can be time consuming. 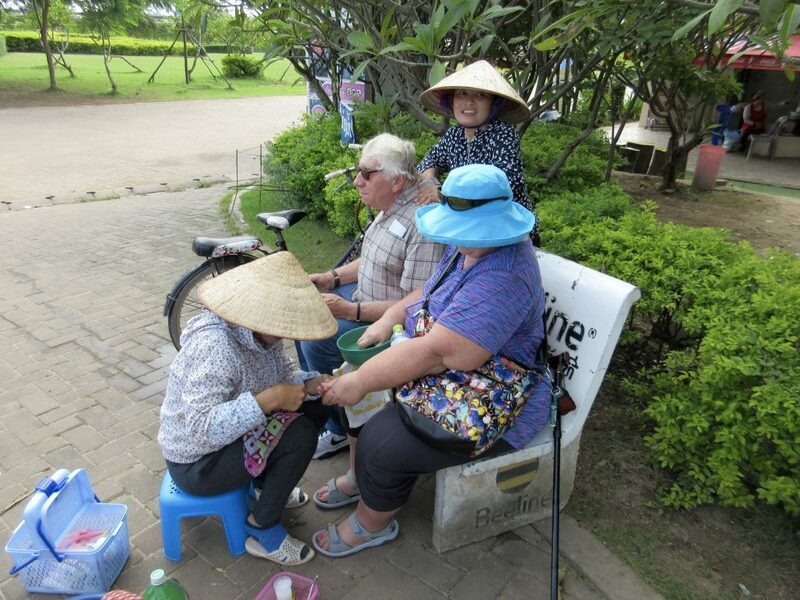 While walking along the river there were several young ladies offering to give manicures, pedicures and back massages. A manicure was only $2 US, a price that is hard to beat anywhere in the world. 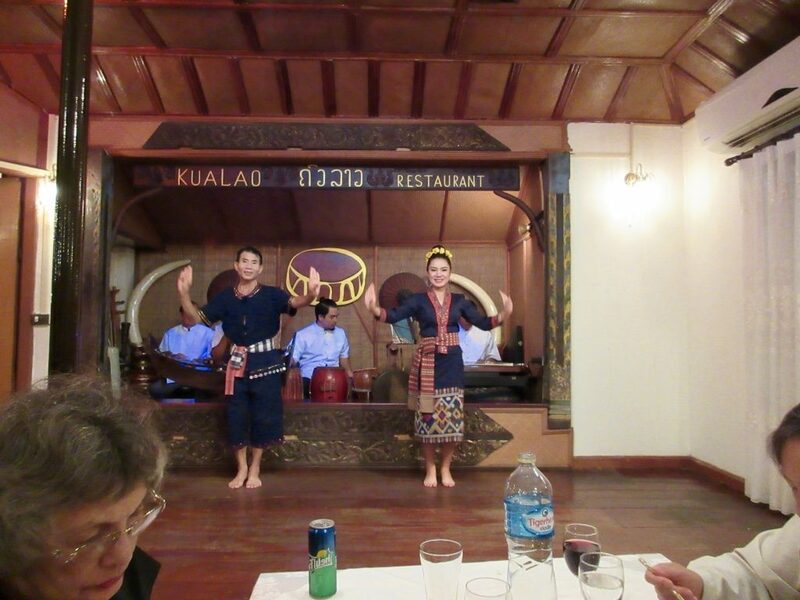 In the evening we walked to a local Lao restaurant where we had a traditional Lao dinner and were entertained by a five-member band and several dancers performing local dances in beautifully colorful outfits. The dinner started with a broth soup with onions, lemon grass, carrots and fresh ginger. The main courses included rice, chicken with herbs cooked in leaf wrappers, pork with an oyster sauce, stir fried vegetables, a ground chicken with spices and fresh herbs dish and deep fried chicken nuggets. For dessert we had fried bananas with honey and ice cream. After dinner some folks went back to our hotel while some of us took tuck-tucks to the riverfront where there is a nightly market from about 5:00pm to 10:00pm every night. The market sold a lot of very inexpensive clothing well under $10 each, but you could also find electronics, souvenirs, and food. There were hundreds of stalls set up under red topped pop-up canopies with one light in each canopy. Vendors disassemble their stands each night and put them up again the next night…..lots of work. Our lost luggage arrived from the airport about 10:45pm which was a relief. 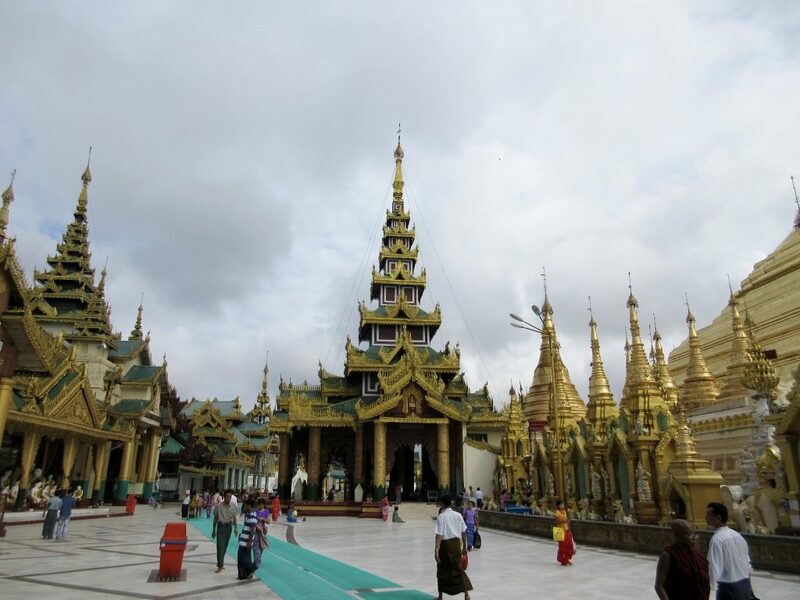 Yangon was the capital city of Myanmar until 2006 when it was moved to a newly built city called Naypyidaw in central Myanmar. Yangon is the largest city in Myanmar with about seven million residents. 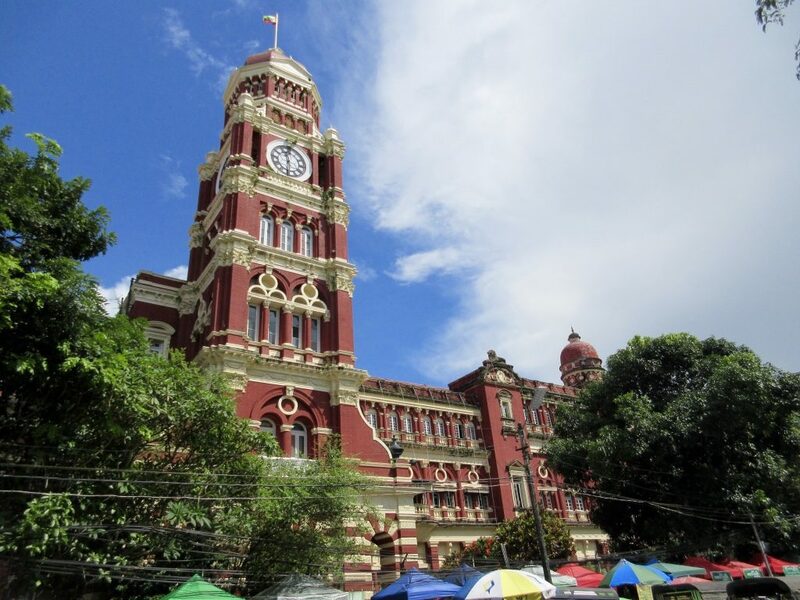 It has the largest number of colonial era buildings in southeast Asia and the colonial-era urban core is mostly intact. The commercial core of the city is believed to date back some 2,000 years. 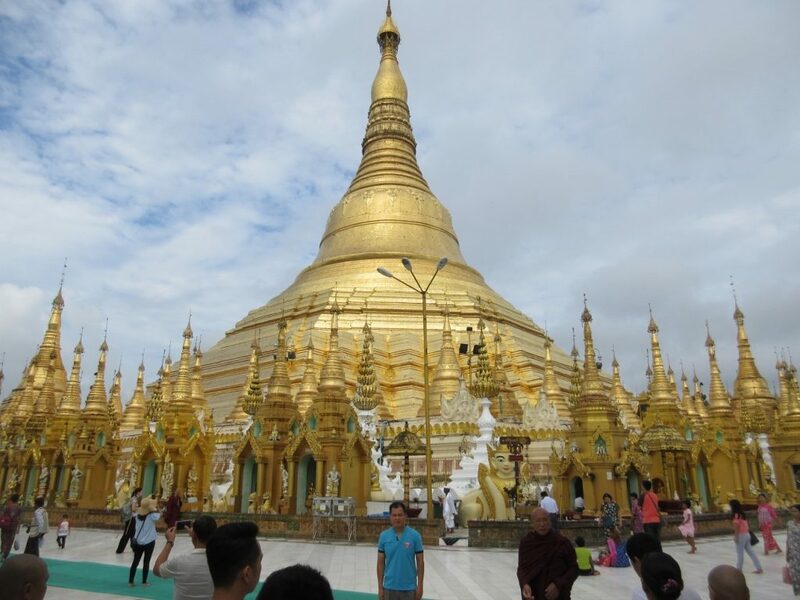 Our first stop was at the Shwedagon Pagoda or Golden Pagoda. It is considered one of the wonders of the religious world. This spectacle is believed to be the earliest pagoda of the Gautama Buddha Era, built by King Okkalapa more than 2,500 years ago. Located on the top of Singuttara Hill, and visible from all over town, the gleaming golden stupa soars 326 feet tall. 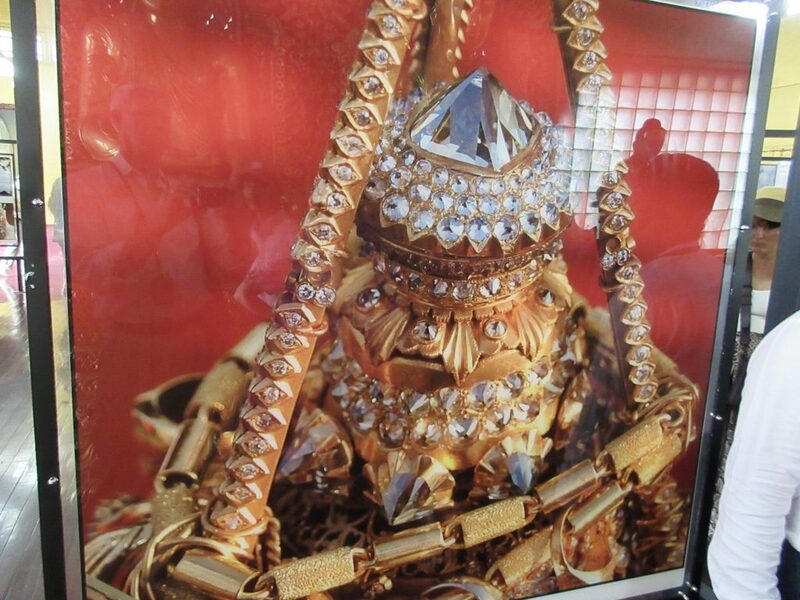 It is topped with more than 6,500 diamonds, rubies and other precious stones. 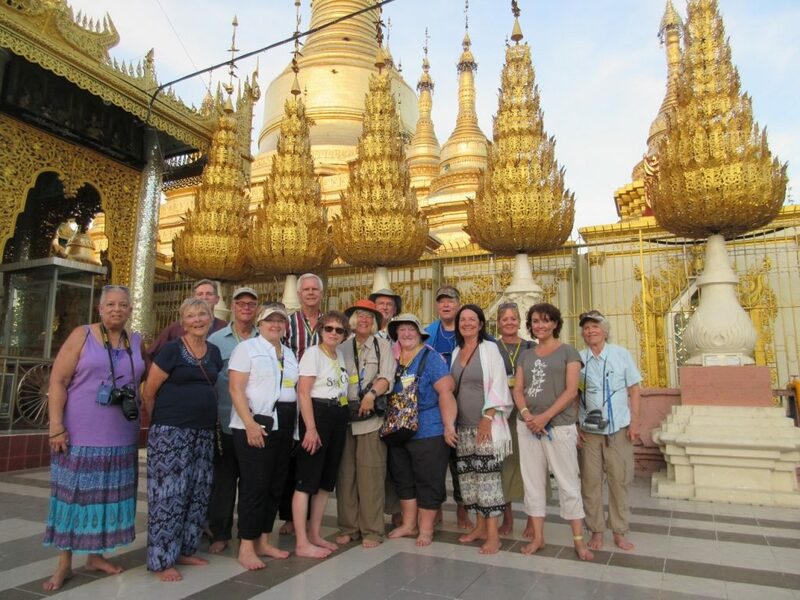 In the tradition of the Buddhist faith, we walked clockwise around the stupa to admire not only the beauty of the golden stupa but the many shrines around it. At the base of the stupa there are hundreds of smaller shrines, some for each day of the week, where you can pray, light a candle, place some flowers, or pour water over the shrines. Some of the shrines are small, while others are large enough to walk into and nearly all of them have Buddha statues standing, sitting or reclining. We had visited this site in 2016. Next we visited the National Museum of Yangon, established in 1952. The current museum was opened in 1996 in an imposing five-story building with about 200,000 sq. ft. of display space. We saw all types of displays from Natural History and Prehistoric items to arts and crafts, performing arts items, jewelry, Buddhist art gallery and fine arts. It is a remarkable museum with a wide ranging collection from all over the country and we could have used more time than an hour to view the entire collection. Next we stopped for a traditional Burmese lunch at a local restaurant called Padonmar. We enjoyed a watered down split pea soup starter, chicken curry, fish curry, beef curry, eggplant side dish with onions, stir fried vegetables and rice. Included were melon balls and fried banana with honey for dessert. It was a very nice meal and more than we could possibly eat. Our next stop (photo stop) was at the Town Hall, built in 1905, across from the Sule Pagoda, at the center of town. There is a beautiful old colonial building that once housed the highest court in the nation, but is now abandoned since the court was moved to the new capital in 2006. At this stop is also the Queen Victoria garden with a large obelisk honoring the country’s independence. The city center is filled with many buildings remaining from the colonial period, although most of the buildings are in very poor condition and in need of repair and paint. Construction appears to be going on everywhere so they do seem to be improving parts of town. From here we proceeded to the 70-year-old Bogyoke Aung San Market, known as Scott’s Market, to stroll the more than 2,000 stalls. The market stalls are filled with masses of merchandise like jewelry, loose semi-precious stones, fabric, clothing, puppets, lacquer ware, woodcarvings, souvenirs and food stalls around the perimeter. Kent purchased a Marionette Puppet dressed in red that caught his eye. For dinner we met several of the folks in our group to walk across the street to a very inexpensive Chinese restaurant. 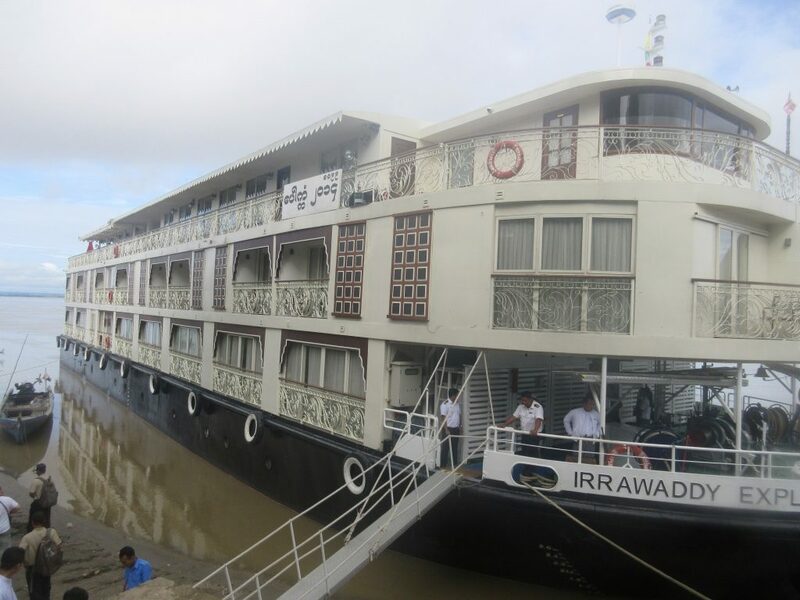 We disembarked our river boat at Prome at 7:30am and headed for the Chatrium Hotel in the heart of Yangon for the next three nights. The weather was gray and rainy along the way and the trip took us about eight hours to complete. The road from Prome to Yangon is a narrow two lane road with one lane in each direction with many motor bikes, trucks and busses competing for space on the road. We stopped at three roadside restaurants to use the facilities and pick up some drinks for lunch. The ship had packed us a box lunch with baguettes of ham and cheese, bananas, apples and cake for the bus ride. The hotel is located next to a beautiful park and a lake they call the royal lake. The hotel is built in the colonial style and has 303 rooms decorated with local fabrics, furniture and tapestries. It looks very nice but our room was a smoking room so it had an odor of cigarettes that was less than pleasant. We had dinner with several other guests: Fred and Sharon, Collene and Gail, Mary and Allyn in the Bangkok Kitchen restaurant across the street from our hotel. Food and prices were good. On this day we explored the colonial town of Thayet Myo, which once guarded the border between Royal Myanmar and British Myanmar. The population here is about 100,000 people. 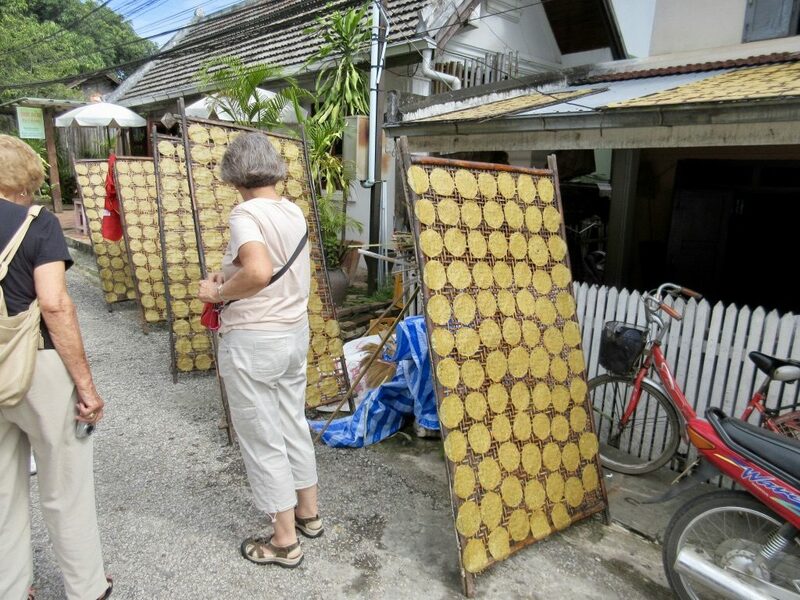 The town had many colonial style homes, some in good condition, while others in very poor condition are standing along side traditional bamboo-sided Burmese homes. We took motorcycle carts to the market this morning to do some shopping directed by our guides. The guides gave each couple a sheet of paper with the name of a food item written on it in English along with a 1,000 kyat note (about .80 US). 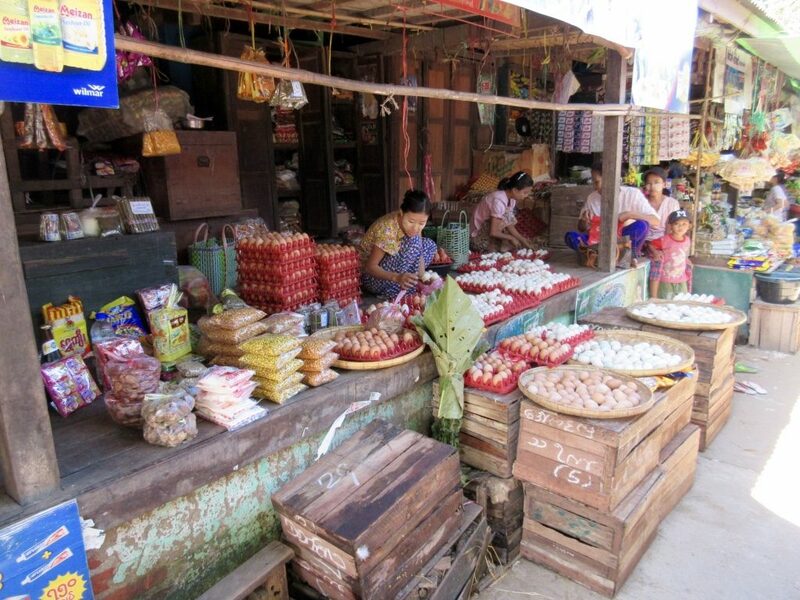 We were instructed to go shopping in the market to find and bargain for the item on our sheet of paper and to not spend more than 1,000 Kyats. Our sheet of paper had the name of San on it, which we found out was the name for rice. 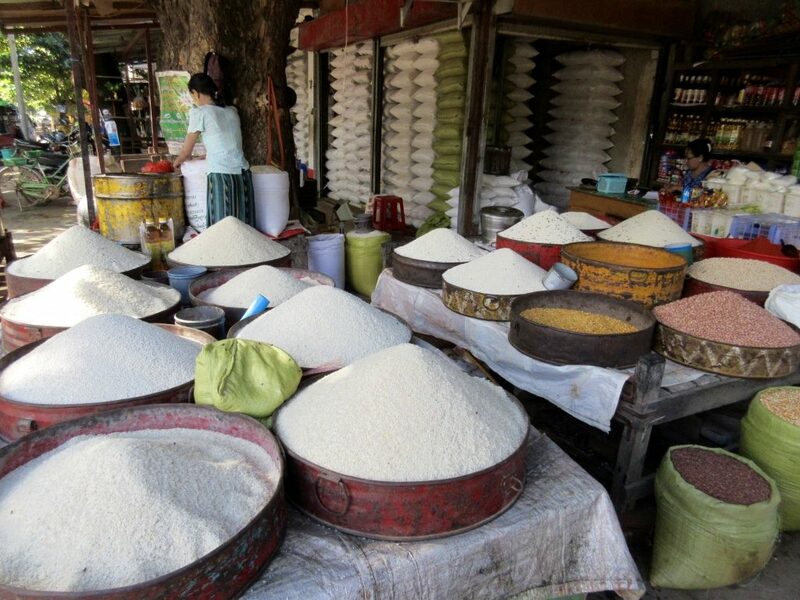 For 1,000 kyats we were able to buy about three pounds of white rice. 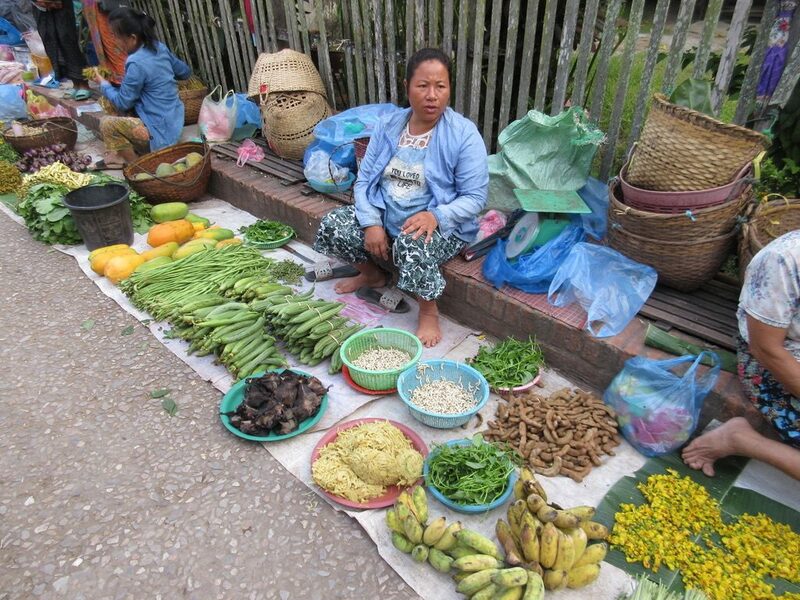 Others purchased vegetables, chick peas, gourds, chili, etc. The local people we have seen so far have been delightful. They quickly wave back to us and respond with the “Mingalaba” or hello greeting when we greet them. They break into a big smile when we greet them and seem friendly. 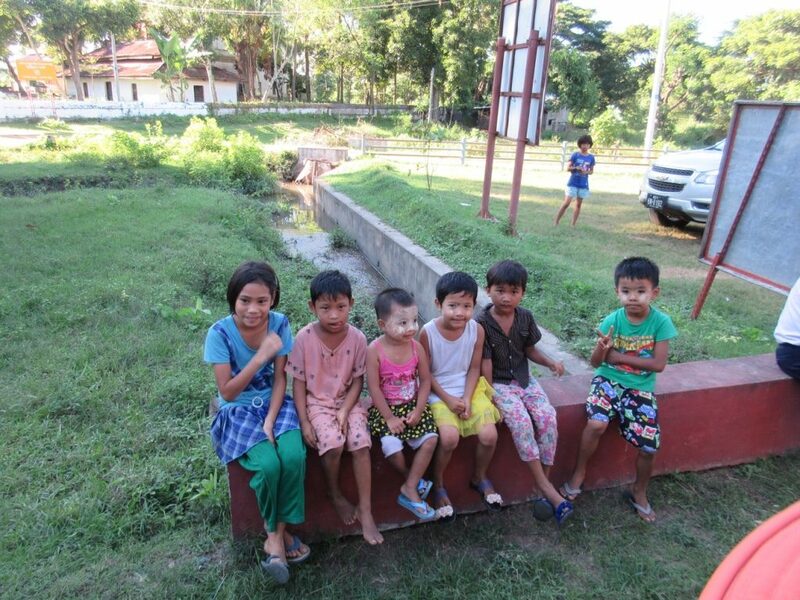 Very few are able to respond in English and we don’t speak much Burmese. However, we have felt very welcome here. Most of the women and some men wear the yellow paste on their cheeks (in a round circle) to protect them from the sun. 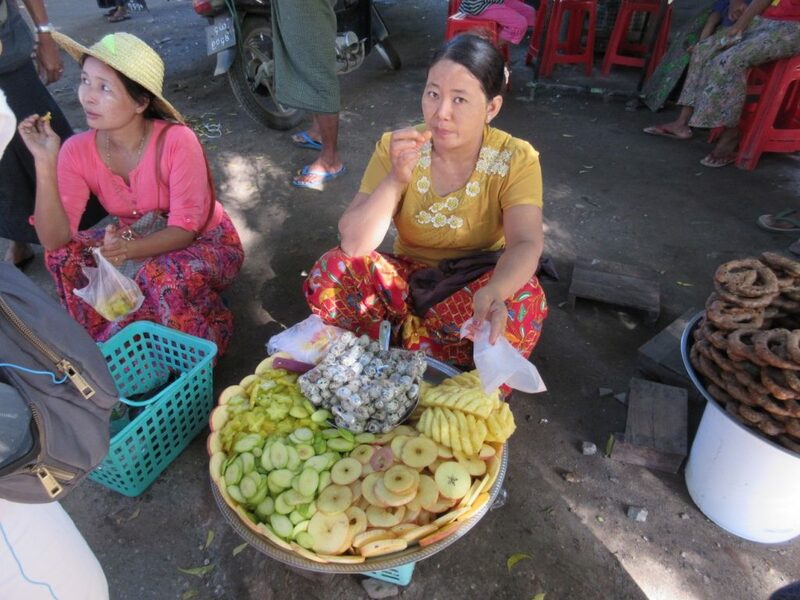 There are many young sales people, (mostly girls) selling local products. “Maybe later, think about it, very good price, etc.,” are all phases we are used to hearing. We then visited the countries oldest golf course founded in 1887 by the British. The nine-hole golf course was nothing spectacular by our standards but it is interesting that it still exists after all these years. While we were at the golf course we presented the items we had purchased at the market to our motorcycle cart drivers. Each cart carried four guests so each driver was given several grocery items. After traveling about 40 miles down the river we arrived in the town of Pyay or Prome once controlled by the Mon tribe during the Bagan Era before being conquered by the Burmese King Alaungpaya in 1754. 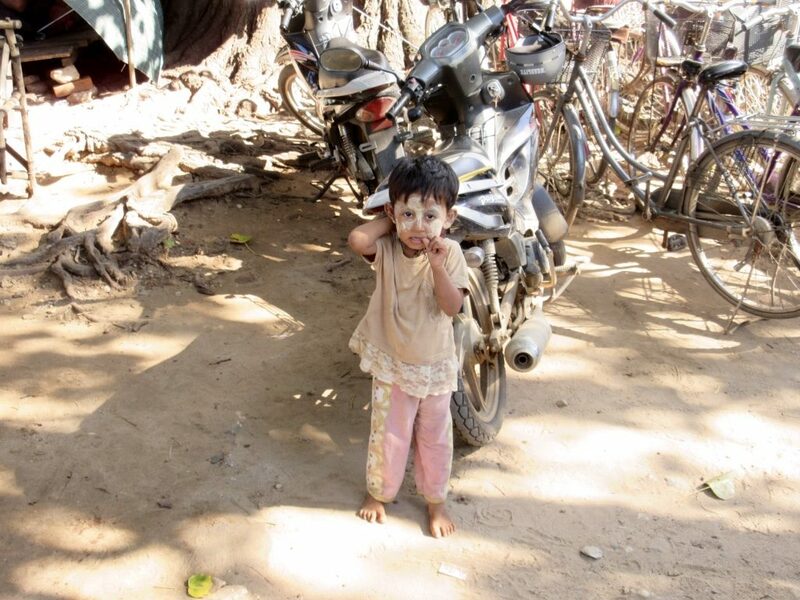 Prome or Pyay is a town of about 85,000 inhabitants today. It has a history that goes back to the 3rd century when the capital of the Tibeto-Burman groups here was called Sri Ksetra or City of Splendor. Today they grow rice, cotton, tobacco and the famous custard apples. These apples are often heart shaped, lopsided or irregular in shape with a yellow or brownish color to them. Beneath the skin is a granular custard like flesh surrounding the segments and 75 or more black glossy seeds. The flavor is sweet but not particularly anything like we think of an apple. Silk weaving, manufacturing of ornamental boxes and coarse brown sugar is also produced here. Here we visited the archeological site of Thayekhittaya, the former center of the Pyu civilization from the 5th to the 9th century. This site has been a UNESCO World Heritage Site since 2014 to protect the remains of the royal palace, pagodas and royal cemetery. 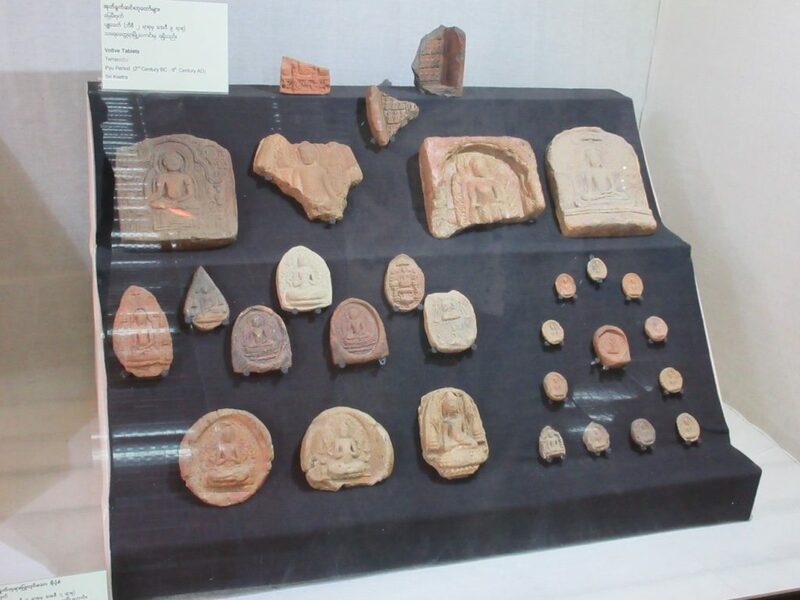 We visited the Ksetra Museum where we saw maps of the area and many artifacts including Hindu deities, Pyu beads, silver coins and Buddha images in stone from as far back as the 6th century. Not much remains of the site today, but they hope to continue to excavate some areas of the site where they hope to find additional artifacts and information of this area. We then visited the Shwesandaw Pagoda complex, believed to be one of the oldest and most important Buddhist pilgrimage sites in Myanmar. The pagoda is surrounded by 83 smaller gilded temples and is believed to have been built by the Pyu queen of the founder of Pyay. 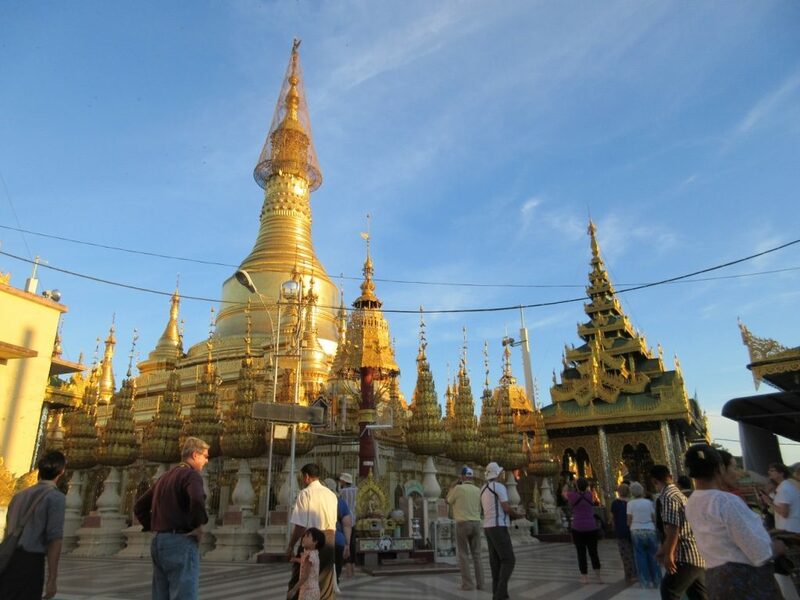 This pagoda is quite spectacular as it is gilded in gold and there is a very large standing Buddha. Dinner onboard the ship was to commemorate the end of our Irrawaddy cruise. 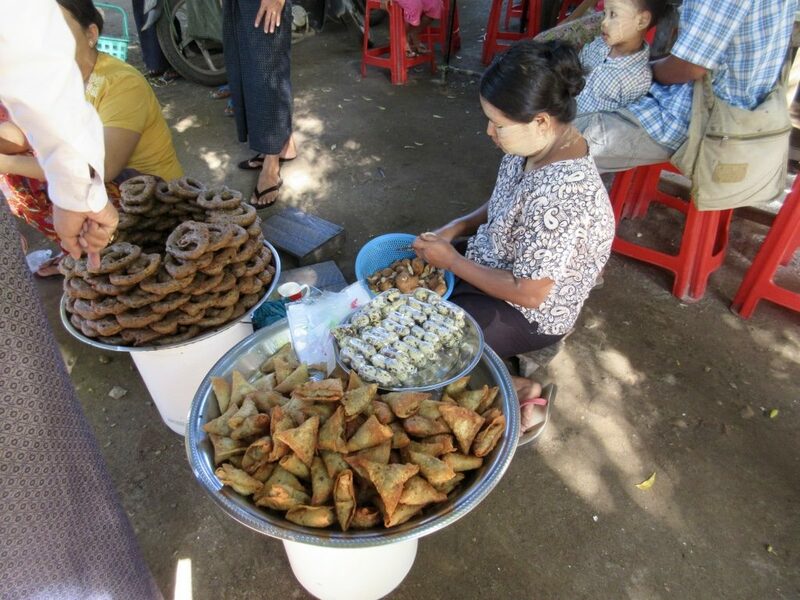 Magwe, a town of about 300,000 is known for growing sesame on something like one million acres of land. In addition to sesame they grow millet, maize, sunflower, beans tobacco, chili, onion, potato and tobacco and peanuts. We took a walking tour from the ship through some of the local streets where they were selling produce, rice and local goods. 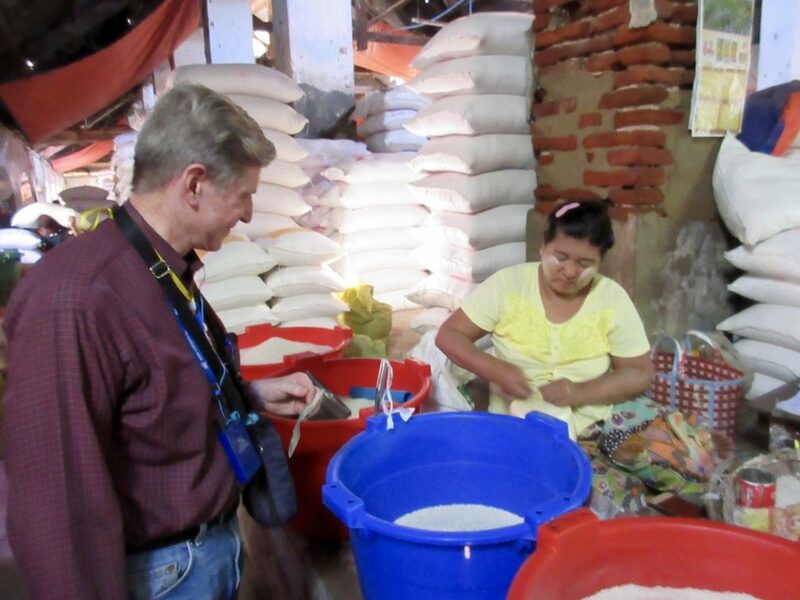 We then stopped at the local market that sells all types of fruits, vegetables, clothing, jewelry, meats and more. This market was more organized than yesterday’s market and the stalls were more defined and spread out a bit more allowing you room to walk down the aisles with more ease. 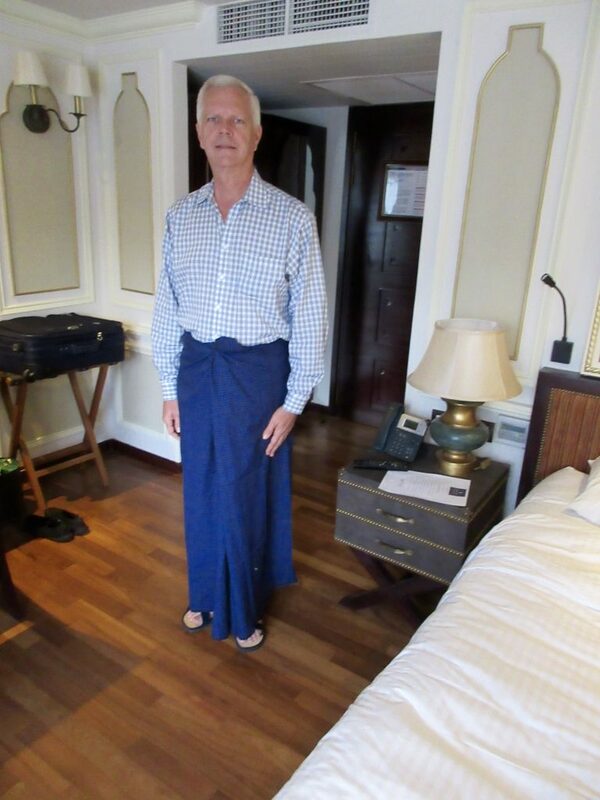 Mark purchased a blue plaid longyi for a party we had onboard the ship that night. The cost for the cylindrical strip of fabric in cotton was a whole 3,000 kyat or about $2.40. We then took another mode of transportation. The trishaw is a three wheeled bicycle where one person sits alongside the driver in a side car. We took the trishaws on a tour of the city. We stopped at the central square and park and our trishaw drivers demonstrated the local ball game they play. They stand in a small circle and use a ball made of woven bamboo that is about six-inches in diameter. The object of the game is to use your feet, head or other body parts to keep the ball off the ground without using your hands. Every time you kick the ball in the air you score a point and the fancier the moves you use, the better score you can get. For every time you drop the ball a point is deducted from your team’s score. 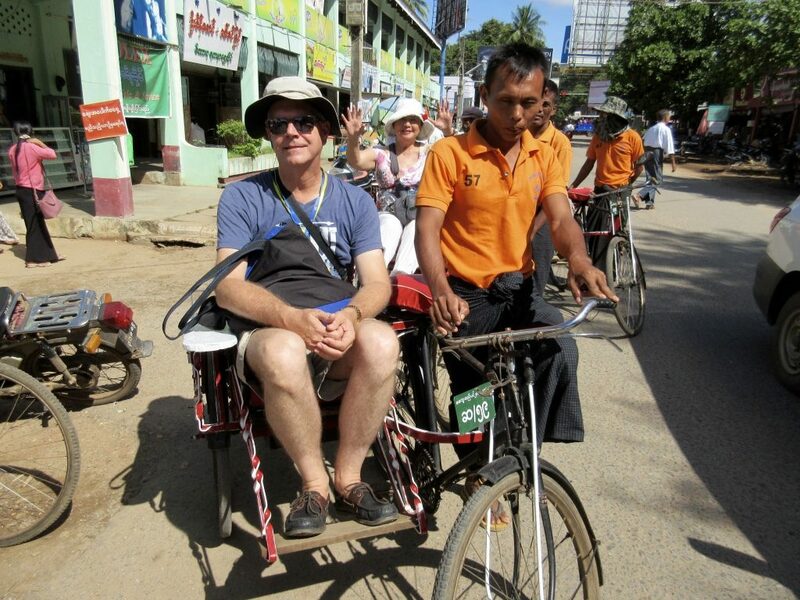 We were taken on our trishaws to the Myat Lun Paya Pagoda where they were having a large annual festival. All around the area there was an enormous market set up with booths selling all types of goods from clothing to kids toys and baskets to all types of foods. The festival lasts about three weeks and then everyone will pack up their wares and head for home until next year. After lunch we attended a cooking class where we learned to make two recipes’. The first was a recipe for a green tea salad and the second was for a ginger salad with fresh ginger. They said that most of the locals prefer their food very spicy with a large amount of red and jalapeno chili peppers used in their food. After the chef prepared the recipes for us they asked for volunteers to compete in a cooking competition to make the tea salad. Mark competed but the captain thought his salad had too much salt. Even though he did not win the competition he got another longyi in a green plaid color. At tonight’s dinner we were encouraged to wear the longyi. Mark had two and decided to wear his favorite, the blue one. Kent declined as it made his hips look big! After figuring out how to tie or knot the longyi, Mark safely left the cabin with his longyi in perfect position. He wore a regular shirt along with the longi. Many other men and women also wore their local clothing. It was a festive group at drinks and dinner. Before dinner the ship hosted a Burmese karaoke party in the lounge. The locals like karaoke and the crew sang a variety of songs for us. Some travelers also volunteered to sing karaoke.